“Big men” have long been the scourge of Africa. Unfortunately for Kenya, it has not one, but two: President Uhuru Kenyatta and perennial opposition leader Raila Odinga. Both are behaving like tribal chiefs, Kenyatta of the Kikuyu, Odinga of the Luo, and both are spectacularly rich in a poor country. Neither appear to be motivated by a vision of the public good. In the aftermath of the Kenyan Supreme Court’s invalidation of the August 8 presidential elections, both appear prepared to take the country to the brink to secure personal advantage in the upcoming October 26 election (which has already been pushed back from October 17, but cannot occur after October 31, per the constitution). President Kenyatta persists in his denunciations of the Supreme Court justices as members of his Jubilee Party in the senate move to strip the Supreme Court of the power to void future elections. Such a move would undermine the independence of the judiciary and almost certainly require amending the constitution of 2010—a constitution which was designed in part to secure the judiciary’s independence following post-election violence in 2007. Meanwhile, Odinga is calling for the wholesale firing of the Independent Elections and Borders Commission (IEBC) and the selection of a different company to print the ballots, warning that he will not participate in the elections if his demands are not met. Kenyatta rejects these demands. If Odinga does not participate, he could still prevent a valid election from taking place: according to Bloomberg, the constitution requires that voting must occur in all of the country’s 290 constituencies for the election to be valid. Odinga could ensure that, in one or two constituencies that this party dominates, voting does not take place. There is no dialogue underway between Kenyatta and Odinga, nor between the former’s Jubilee Party and the latter’s National Super Alliance (NASA), according to Kenyan media. 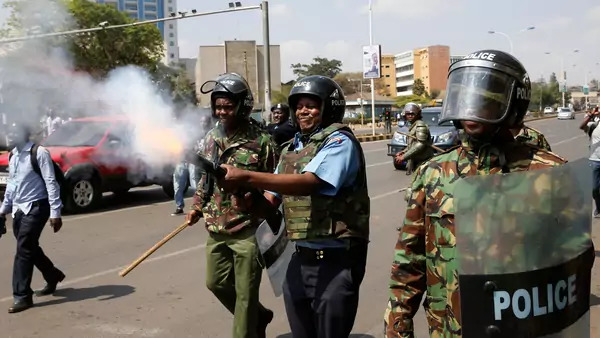 Odinga is calling for demonstrations; in Nairobi, on September 26, pro-Odinga demonstrators chanted “no reforms, no elections,” and stoned police and counter-protesters. The police responded with tear gas. Demonstrations are also taking place in other cities. However, the media reports that supermarkets are open and people are going about their business. Meanwhile, the police have removed the security detail assigned to Odinga and his running mate, Kalonzo Musyoko. Bloomberg reports that investors in Kenya are “unnerved;” yields on Eurobonds have risen by 44 basis point, but the shilling has weakened only slightly against the dollar. Investors, like everybody else, are mindful of the possibility of ethnic violence as has occurred in previous post-election periods. At present the two “big men” are at an impasse and the potential for demonstrations to turn violent is real. If the impasse continues, there is the possibility that there will be no elections on October 26, leading to a constitutional crisis. How it would be resolved is not clear.